The Lakeview Heights community name paints a perfect picture of what this incredible Kelowna neighbourhood is like. The best of old and new Kelowna resides in these Californian-inspired suburbs which possess some of the city's premier waterfront properties. Lakeview Heights homes for sale evoke a special kind of glamour characterized by lavish lakeside living, semi-arid hills, and awe-inspiring contemporary architecture. The residences here capture the imaginations of design-savvy buyers, water sport enthusiasts, affluent retirees, and those willing to settle for no less than an exclusive West Kelowna lifestyle. If this opulent community sounds like it fits what you're looking for, you've come to the right place. Explore Lakeview Heights real estate listings below. Or, find out more about homes in Lakeview Heights by reading about its world-class homes and lifestyle features right here on VantageWestRealty.com! Sign up for an account today! Access all listing details, save your search criteria, and register for exclusive property notifications, all with the option to unsubscribe at any time. Lakeview Heights real estate is an integral part of Kelowna's luxury market, with some of the most attractive modern and traditional homes in the metropolitan area. The lucky few who found or built a property in this panoramic area several decades ago are likely to sell a spacious yet dated home on a sizeable green lot for a pretty penny. As a result, new buyers have an array of established, modest homes to choose from. Often on gorgeous parcels of land, these homes can be maintained as-is, beautifully renovated and modernized, or simply torn down and replaced with a custom build of the owner's choice. The luxury homes of Lakeview Heights are characteristically tucked along bluffs and ledges, affording them exceptional views of the deep lake and its backdrop of mountains and sunlit or snowy forests. These vistas are truly unforgettable and newer homes are built to maximize them with large windows, huge balconies, and wind-whipped rooftop lookouts to make your head spin. In the neighbourhood there is a wealth of property choices, including stylish contemporary duplexes and townhouses and elegant two-story homes from the 1990s to 2000s boasting coach lights, stone and stucco exteriors, and plenty of curb appeal. Moving up the market, options increase to include modern Craftsman dwellings, sprawling hill homes with guesthouses, and gated vineyard estates. By the $1.2 million mark, you can truly get an idea of the real estate innovation that is so widespread in Lakeview Heights: massive custom mansions wind along spectacular roads with wine-inspired names such as Malbec, Pinot Gris, Pinot Noir, and Shiraz. These large-scale homes feature everything from granite soaker tubs with private lake views to palatial balconies, fitness centers, wet bars, and wine cellars. Gourmet kitchens, in-ground saltwater pools, heated cabanas, and high-tech home automation are simply the norm in this sector of the Lakeview Heights market. Impressive contemporary and Spanish-inspired architecture add to the Mediterranean-like atmosphere felt along the picturesque roads of the community. Lakeview Heights homes range up to $5,000,000 and display stunning French, Tuscan, and Californian influences. Estate residents enjoy exceptional indoor-outdoor flow, access to first class wineries, and resort-like property features. Chalets with viewing towers, indoor pools, and boat docks display sumptuous clean finishes that represent the latest breakthroughs in luxury craftsmanship. 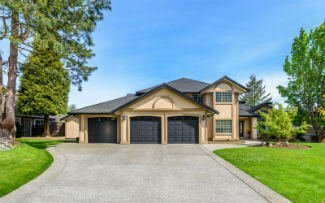 Ideal for the most selective upmarket buyers, these properties are great for year-round luxury living or for delightful, dry summers in British Columbia's wine country. Homeowners in Lakeview Heights experience Kelowna at its most impressive with shimmering water views, sunbaked hills, and fruitful vineyards at every turn. Famed nearby wineries include Rollingdale Winery, Volcanic Hills Winery, Beaumont Family Estate, and Mt. Boucherie Estate Winery. Little Straw Vineyards is also nearby and Quail's Gate is a great place to discover local wines and enjoy excellent food. Lovely wine and dining options are clearly abundant; The Hatch is a hip choice for hopeful sommeliers, while the local join Borneo Bistro offers authentic Malaysian cuisine in a friendly, cozy setting. The neighbourhood's sandy Kalamoir Beach is a great place to kick off lake-based adventures, while its adjoining park is a beautiful place to soak up the sun and scenery. Casa Loma Lakeshore Resort is in this area, while Shannon Lake Golf Course is a 10-minute drive west. Downtown Kelowna is a 5 to 10-minute cross-lake commute, making access to the city lights simple. Still, Lakeview Heights residents will love the quiet nights and peaceful privacy that the luxury neighbourhood supplies. If you're looking for qualified Kelowna real estate advice or are thinking of investing in a gorgeous Lakeview Heights home, chat with an agent from Vantage West Realty today.